May Day is known around the world as a labor holiday, International Workers Day, when we honor those who fought and died for fair wages, safe conditions, time off, and ethical standards in the workplace. 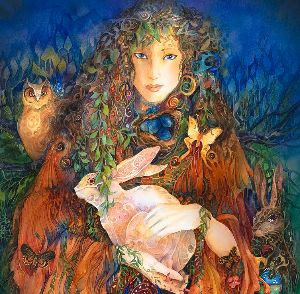 However, an even older tradition is the celebration of the rites of Spring, the pagan festival of Beltane on May 1. The Wiccan Sabbats were considered holy by ancient peoples because they marked changes to the light in the sky and seasons on Earth. The Wheel of the Year turned on eight days of power: the Winter and Summer Solstice, Vernal and Autumnal Equinox, and mid-points in between. The mythology surrounding these moments illustrate the cycle of birth, death, and rebirth as told through divine figures, the Goddess and God. The particulars differ for every culture, and I encourage you to investigate the deities and stories of your own ancestors. Reconnecting with these lost traditions can help us feel more connected to the divine in our modern daily life. The Sun is now in Taurus and we are midway through Spring. Passion and vitality are returning to Earth, and life bursts forth in color. 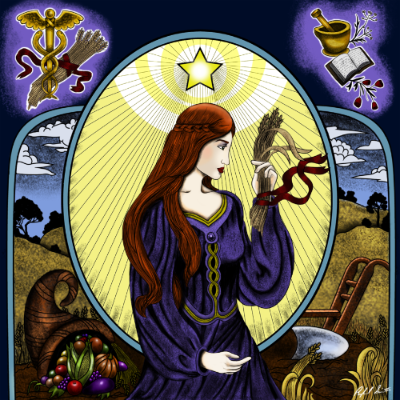 At Beltane the Goddess and God join together in fertility rituals to bring life back to the land. Garlands were braided to signify their sacred union. People often rose at dawn to gather fresh flowers and green branches to decorate their homes and altars. May poles were erected in town squares and people danced around them ecstatically. Hopes and dreams were written on paper and thrown into cauldrons symbolizing the womb of the Goddess who becomes pregnant with life once more. On May 1, take special time to notice the young flowers and budding trees. Thank the beautiful magnolia and cherry blossoms that fill our hearts with hope that Summer is on her way. Celebrate the life that is yours in whatever way makes you feel vivaciously vibrant. May is a month of big changes and many important beginnings. Things might start out quiet, but there’s a big bang in the galaxy at the Taurus New Moon, on Tuesday, May 15, when Uranus, the planet of rebellion and revolution, enters Taurus for the first time since 1942. Unexpected and sudden shifts are Uranus’ specialty, and she will stay in this earth sign until 2026, giving a massive overhaul to our relationship with Gaia and how we collectively work with natural resources. Later that evening, Mars ingresses into Aquarius for a five month stint during which he will square Uranus three times. These squares are going to shake up at least two major areas of our lives. Check out my weekly Instragram posts for more information, or better yet, book a chart reading to learn more because the shock waves will continue to reverberate for a long time. After a wild ride through Aries, Mercury will finally enter Taurus on May 13,rolling out the welcome wagon for Uranus when she arrives. This conjunction is like the town crier having a politico upstart staying at their house. Uranus is going to announce what she intends to do in big bold letters that week for all the world to hear. The far-out outer planet’s influence is going to be FELT the week on May 14. Pay attention to what you learn and what starts to move (possibility in an erratic fashion). Venus glides into Cancer on May 19, but her reception will be a bit bumpy because of an immediate sextile from Uranus. You can’t protect yourself from these waves, but you can intend to be flexible. The Sun enters Gemini on May 20, putting an emphasis on the acquisition of knowledge and greater understanding. Gemini is an air sign that rules the mind, and for the next four weeks there will be an emphasis on creative problem solving, which is a good thing since Uranus will be stirring so much up. Mercury, the ruler of Gemini, joins the Sun here on May 29, giving a boost of alacrity to all communication projects. However, Gemini can be impulsive and enjoys quick movement. Be sure to think things through thoroughly and involve others before carrying out your brilliant plans.